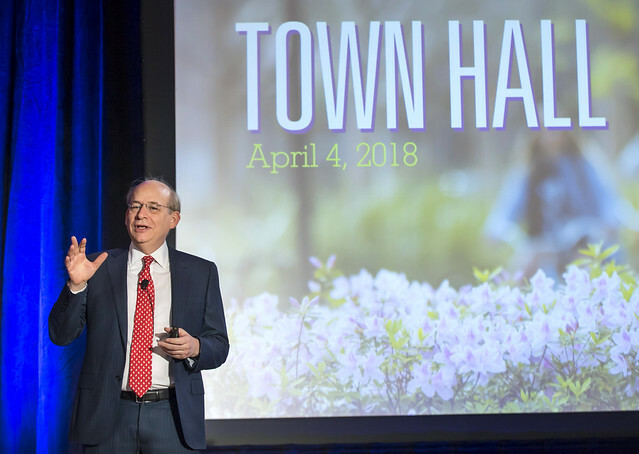 President David Leebron praised Rice’s resiliency and strong sense of community following a difficult year for Houston and the campus, from the impact of Hurricane Harvey to the potential effects of immigration policies, during his April 4 town hall. “I think what draws people to Rice and keeps them here is that extraordinary sense of community, and that is very much reflected in this room,” Leebron said to a standing-room-only audience in Rice Memorial Center’s Grand Hall. Leebron said the spring town hall historically serves as a celebration of Rice’s people, who are buoyed by the university’s core values: responsibility, integrity, community and excellence. Leebron cited several examples across campus that also demonstrated Rice’s unique sense of community, including a statement by the Student Association in support of free speech on campus, a new working group on sexual harassment and support for the Deferred Action for Childhood Arrivals program. “At the core of this is our people, and I am amazed every day by the outstanding quality of the people in our community and their commitment,” Leebron said. He said the people of Rice are instrumental in the development and execution of the university’s Vision for the Second Century, Second Decade (V2C2), which was endorsed by the Rice Board of Trustees in January. “This is what we really are about as a university, really transforming the lives of our undergraduates, building graduate programs that are renowned for their excellence, propelling our students into a range of careers at the highest level and investing in our extraordinary faculty,” Leebron said. Over a decade ago, when the original Vision for the Second Century was conceived, it was determined that increasing the student body population would be the best way for Rice to make more of an impact on the world. Now, with the V2C2, the university is extending its reach and impact in new ways, he said. Invest in faculty to achieve preeminence. Leebron also announced that the groundbreaking for the new Social Sciences building will happen in the next school year. The building will be located on the Inner Loop across from the Baker Institute for Public Policy, forming “an exciting new policy corridor involving the School of Social Sciences, the Baker Institute and the Jones (Graduate) School (of Business),” he said. Leebron also said that Rice’s online enrollment numbers have soared to more than 2.5 million, including more than 150,000 in fiscal year 2017. Each spring town hall includes staff recognition. The Elizabeth Gillis Award for Exemplary Service was presented to Philippa Angelides, associate director of the Rice Student Center. Leebron also recognized 323 employees for service milestones of five years or more. Of these, two – Umbe Cantu and Pat Jones — were recognized for service of 40 years or more, an indicator that Rice is a place where people want to spend their careers, Leebron said.